In 636 AD, Jerusalem was captured by the Muslims. For several centuries, it was okay for Christians to travel to the Holy Land, and this became very important to them. But then in the eleventh century, some fanatical Muslims started to prevent Christians from journeying to the Holy Land. This is when the Crusades began. 3) Union – taking the illumination, or what you received in the center, back into the world. Today we don’t make a big deal about going to Jerusalem. 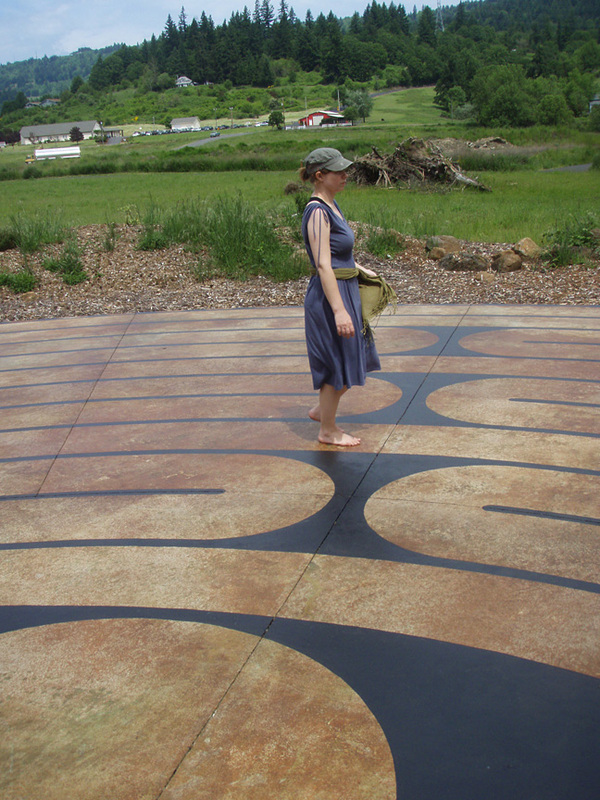 As Quakers we see all of life and all places as sacred. One place isn’t more sacred than any other place. 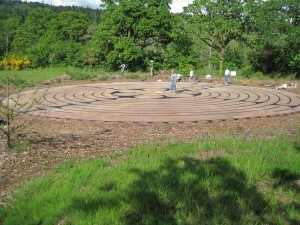 Our approach to the use of the labyrinth is simply one of a creative prayer exercise which allows us to use all of who we are: mind, heart, soul, and body in prayer. This is simply a prayer exercise. 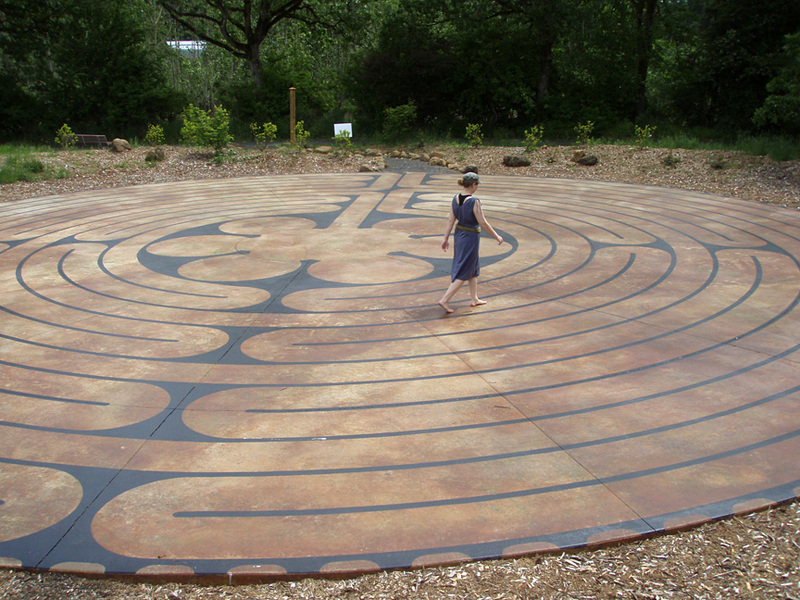 There isn’t anything unusually sacred about the labyrinth. It’s simply a tool. Hopefully a helpful tool. But you could do this sort of prayer anywhere. There is no “right” way of doing this prayer exercise. The right way is the one that allows you to become open to Christ. But it’s important to remember that the entire experience is with Christ. Christ is not in the middle and you’re journeying to Christ, but Christ is on the entire journey with you. Come to me, all you who are weary and burdened (letting go, unburdening myself), and I will give you rest (being in the center, resting in Christ). Take my yoke upon you and learn from me, for I am gentle and humble in heart (going back into the world with Christ yoked together with Christ in ministry). We are torn loose from earthly attachments and ambitions… (purgation, letting go) And we are quickened to a divine but painful concern for the world (unification, coming out into the world together with God). God plucks the world out of our hearts (purgation, letting go), loosening the chains of attachment. And He hurls the world into our hearts (unification, coming out together with God), where we and He carry it in infinitely tender love. 1) Letting go when walking in (confession, letting go of things that seem to be weighing you down or blocking you to God’s activity in your life). Listening to Christ in the middle (receiving forgiveness and call to change). Then take what you heard in the center back into the world. 3) Saying the Beatitudes (Matthew 5:3-12) as you walk into the middle (prayerfully examining your life). Listening. Saying Beatitudes as you walk out (prayerfully considering how to live those out in the world). 4) Praying through a life transition. Giving thanks for the past as you move in. Resting in God in the middle. Moving into the new calling as you move out. 5) Moving through fears as you move into the middle (rest/peace). Resting in Christ in the middle. Moving out in the confidence and power of Christ. 6) Sharing with Christ your desires (for relationships, for the future, for loved ones) as you move into the middle. Resting in the middle and listening for Christ’s response to your desires and for Christ to share his desires with you. Then move out in union of desires. 7) Read the death and resurrection story in Mark 15-16. Then as you move into the center, prayerfully reflect on Jesus suffering. Spend some time in silence in the middle, contemplating Jesus’ death and then as you prepare to leave the middle, focus on the resurrection, prayerfully reflecting on his resurrection and presence in your life as you journey out. 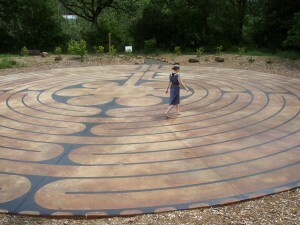 1) Prayerfully prepare yourself before entering the labyrinth, giving this time to God. 2) Give space between yourself and the person in front of you, especially when entering. 3) When you come to another person, just step around: remember, everyone is praying, so allow people to be a part of your experience and try not to allow others to be a distraction. Don’t spend energy trying not to think about other people, but when your attention is drawn to someone else and away from prayer, just gently bring yourself back. 4) There probably will only be room for about 3-4 people in the center at a time, so remember that the prayer experience is occurring when you’re walking and in the middle, and be mindful not to spend too much time in the middle. 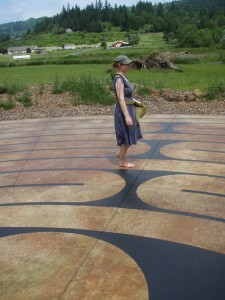 5) Spend a few minutes in reflective prayer when your done. Click here to support the Peace Project!